City Council candidate Matthew Howes calls claims in a campaign mailer targeting his North Side restaurant “blatant lies,” and the Spokane Regional Health District is disputing the accusations of code violations. The advertisement, which hit mailboxes in northwest Spokane last week, ties Howes to violations at Adelo’s Pizza, Pasta & Pints and questions his fitness to serve on the City Council. The health district, through a spokeswoman, said the claims in the mailer did not match the agency’s records and an investigation was underway involving the use of the district’s logo on the ad, which was not authorized. Kim Papich, a spokeswoman for the health district, said in a statement “that inspection data provided in the mailer is inconsistent with health district records.” The dispute appears to be over who was in charge of the restaurant at the time the violations were found, based on online records provided by the political action committee. The Spokesman-Review was provided copies of all inspections performed by the health district at restaurants operated by Howes late Monday. Those records had previously been posted online, but they are no longer available due to a software upgrade, according to the health district. The district performed 15 inspections of restaurants where Howes is named as the person in charge between May 2010 and Sept. 7. On five occasions, health inspectors found no violations. In others, produce was determined to not be chilled to the proper temperature, items were blocking sinks and thermometers weren’t present. In one case, a worker was cited for turning off the faucet with their bare hand, rather than a paper towel as required by regulations. Records show that the restaurant was fined $190 to cover the costs of a follow-up investigation that occurred this September. Inspectors returned to check on buildup in an ice machine, what is considered a “low-risk factor” for foodborne illness by the health district. The restaurant corrected the issue on the follow-up visit, according to records. The mailer was prepared by a political action committee called Spokane For Honest Government. The group provided a printout of the alleged code violations they discovered in an online records search before the health district took those records down. Their records included seven site inspections, at least three of which occurred in locations where Howes wasn’t in charge of the restaurant. Howes’ campaign issued a statement over the weekend condemning the communication, saying it was “spreading blatant lies” about his business in an effort fueled by support for his opponent in the race, incumbent City Councilwoman Candace Mumm. Howes said in an interview Monday that he didn’t own Adelo’s at its first location, included in the records provided by the group Spokane For Honest Government. Records provided by the committee show nine alleged code violations at that location, before Howes took over operations of the restaurant. “I knew politics was ugly, but I didn’t realize that it got personal,” Howes said. Randy Marler, the campaign manager for Spokane for Honest Government, defended the mailer Monday. 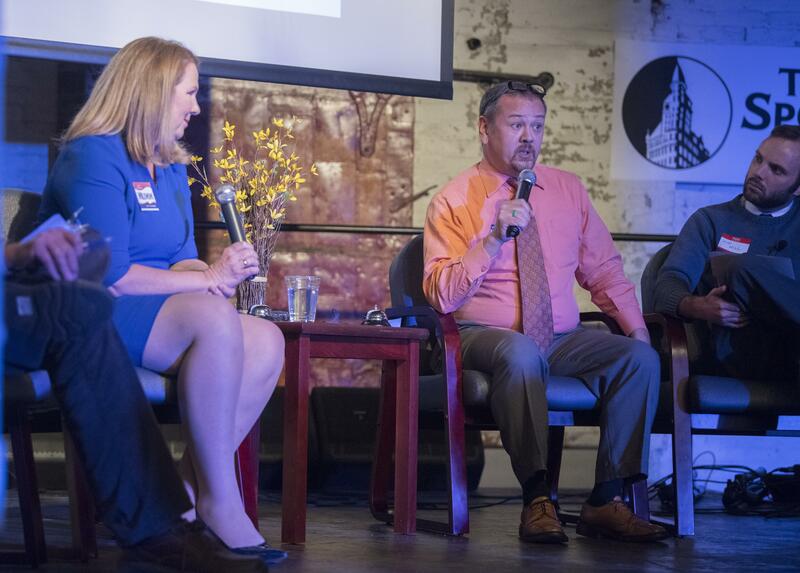 “We are just trying to get the information out there, and show what type of leader he might be on the city council,” Marler said. Marler is also president of the Spokane Firefighters Union Local 29, but he said the communication did not reflect the views of that group. A bulk of the $18,000 raised by the Spokane For Honest Government committee came from the group Safest City Spokane, which has the same business address as the union. Its email address is the same as one used by the union’s political action committee. Marler said Howes’ dispute should be with the health district, not his organization. Mumm said she had nothing to do with the mailer, which she hadn’t seen as of Monday. She also noted that she’d been the target of political communications, referencing a billboard on North Monroe Street that urges voters not to mark her name because of her support for a controversial lane reduction. “I think voters should base their decision on selecting a council member who is the most qualified for the job,” Mumm said. This story was changed Oct. 24, 2017, to clarify the circumstances of a follow-up investigation at Adelo’s by health district officials earlier this year. Published: Oct. 23, 2017, 2:22 p.m. Updated: Oct. 24, 2017, 4:08 p.m.